When a bar feeder is used as the fixture, one piece of bar stock is loaded and simply advanced into position before each cycle, rather than loading a new workpiece. The bar advance time is the amount of time (in minutes) required to advance the bar into position for the next part to be machined. The material at the end of a piece of bar stock that will not be used. The bar end, or bar remnant, is typically the result of a device holding the bar while the stock is cut. 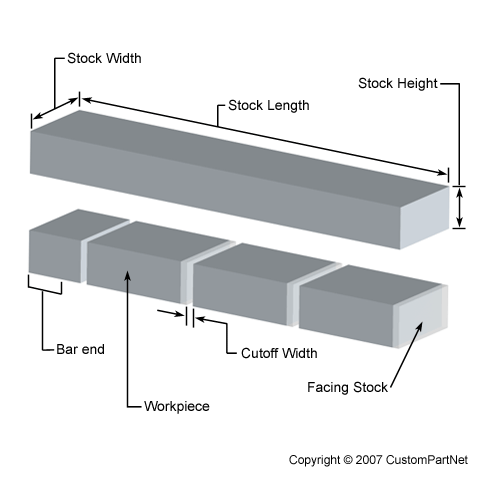 The bar end is used in determining how many workpieces a single piece of bar stock will yield. When a bar feeder is used as the fixture, one piece of bar stock is loaded and simply advanced into position before each cycle, rather than loading a new workpiece. The bar load time is the amount of time (in minutes) required to load the bar, which occurs everytime the number of workpieces per bar have been machined. The length of the neutral axis between the bend lines, or in other words, the arc length of the bend. 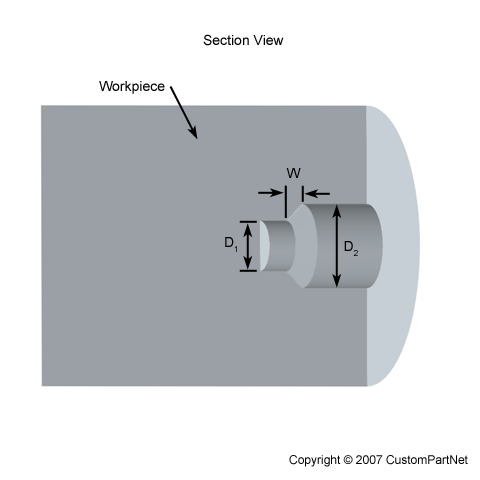 The bend allowance added to the flange lengths is equal to the total flat length. The angle to which a piece of material has been bent. The bend angle can be measured between the bent material and its original position, or as the included angle between perpendicular lines drawn from the bend lines. The bend deduction, sometimes called the bend compensation, describes the amount a piece of material has been stretched by bending. The value equals the difference between the mold line lengths and the total flat length. 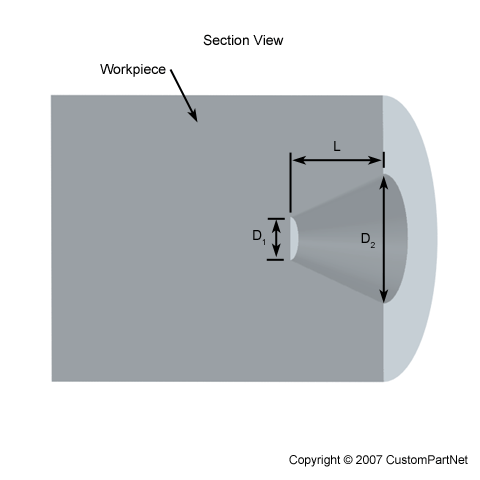 The mold line lengths are the distances measured to the outside mold line and are equal to the flange lengths plus the setback. The amount of force required to bend a piece of material into a new permanent shape. The bending force must create enough stress in the material to exceed the yield strength, allowing the material to plastically deform. In bending, the applied force will cause tension on side of the material and compression on the other. 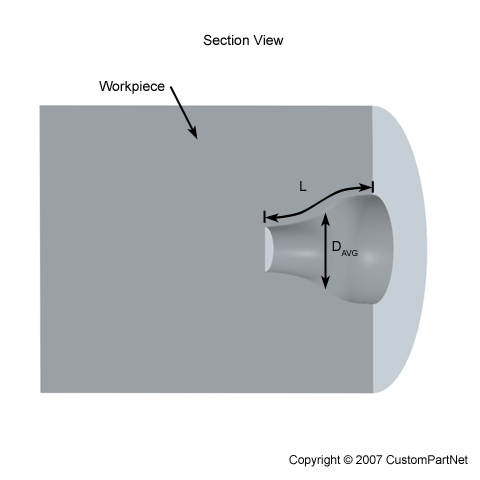 The length of a bend formed in a piece of sheet metal. This length is measured along the bend axis, which is typically a straight line. The radius of a bend in a piece of material that occurs between the bend lines. The radius is measured from the bend axis to the inside surface of the material and is therefore sometimes specified as the inside bend radius. The bend radius is typically equal to at least the sheet thickness. A piece of sheet metal that is used as an initial workpiece on which other sheet metal operations will be performed. Blanks are cut from a larger piece of sheet stock in the blanking process and typically have a simple geometric shape, such as a rectangle or circle. 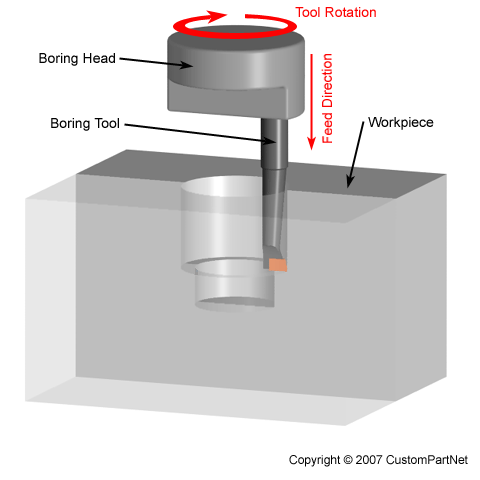 An operation in which a boring tool enters the workpiece axially and cuts along an internal surface to form different features. 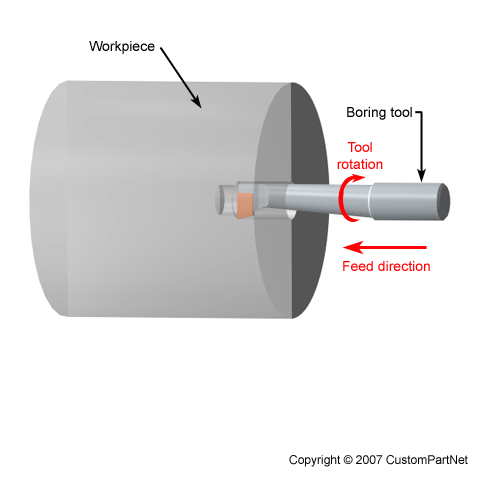 The boring tool is a single-point cutting tool, which can be set to cut the desired diameter by using an adjustable boring head. 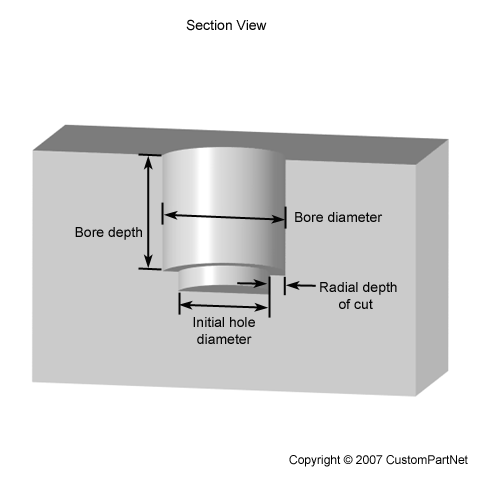 Boring is commonly performed after drilling a hole in order to enlarge the diameter or obtain more precise dimensions. On a turning machine, a variety of features can be formed, including steps, tapers, chamfers, and contours. These features are typically machined at a small radial depth of cut and multiple passes are made until the end diameter is reached. For a finish turning operation, the cutting feed is calculated based on the desired surface roughness and the tool nose radius. 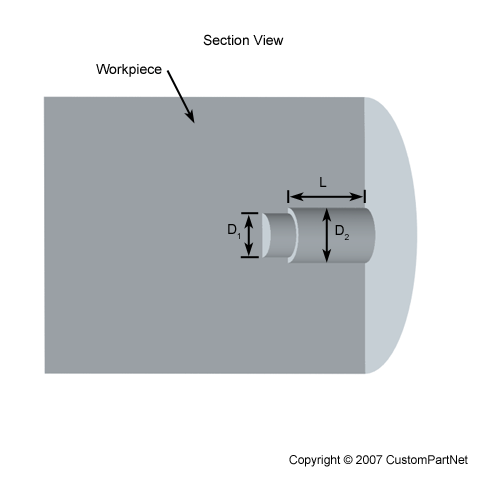 A cylindrical protrusion on a part that is used for aligning or fastening another part by accepting a screw or other insert through a hole in the center. The type of box recommended for packing may be a corrugated cardboard box or a wood crate. Corrugated cardboard boxes are characterized by their wall thickness and test strength, which both determine the maximum weight the box can hold. The test strength listed here is the bursting strength measured in pounds per square inch. ASTM E10. A common standard method of measuring the hardness of metallic materials. A hardened steel or tungsten carbide ball is pressed into the smooth surface of the material with a specific load. A microscope in used to measure the diameter of the indentation in the material surface and then compared to the corresponding Brinell Hardness Number (BHN) on a chart or calculated from a prescribed formula, the applied load in kilograms divided by the surface area of the resulting impression in square millimeters. The Brinell hardness test for steel involves impressing a 10 mm diameter hardened steel or tungsten carbide ball with a load of 3000 kilograms. The Vickers hardness scale is preferred for steels with a hardness over 500 BHN. In additive fabrication processes, a part is built by adding layers of material upon one another. The build speed refers to how fast the part can be fabricated in this way and depends upon the specific process and equipment being used. Build speed can be measured as the amount of area in one layer built in a given time (X-Y direction), the number of layers built in a given time (Z direction), or as a volumetric rate.